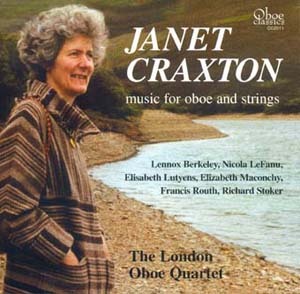 A CD has been released of Janet Craxton and the London Oboe Quartet with music for oboe and strings. The CD, released by Oboe Classics, has been produced from BBC recordings made by the group in the 1960s and 1970s and is an important record both of the magnificent quality of Janet's playing and the contemporary music of that period. We are very pleased to state that you may purchase a copy of the CD through the Craxton Memorial Trust. All profits from the sale will go to assist the Trust's work in helping young, talented musicians in need to achieve their goals.